WhileSam Humphreys' javelin throws have been flying to the top of the national lists this spring, the Alexander TX senior himself has been flying somewhat under the national radar. Competing in a state that doesn't offer the javelin on its slate of sanctioned high school events, Humphreys has had to resort to competing unattached with his Club Olympia team in collegiate meets to throw the jav. Despite those obstacles, he leads the nation with a throw of 220-1 at the Laredo TX Border Olympics, and has backed it up with a 214-06 at a Baylor meet, both last month. Humphreys is a discus thrower and shot putter for his high school as well, but it's in the javelin where he truly shines. Last year, his season was shortened-- and nearly ended altogether-- by a broken right foot sustained in practice. He bounced back with a screw inserted in the fractured bone to win the USATF Junior Olympic national title for Young Men's javelin with a heave of 211-08 in late July. DyeStat senior editor Dave Devine heads to the Lone Star State for some throwing lessons from one of the nation's top javelinists. 1) You're having a great start to the season, although some of your javelin marks have slipped under the national radar as they've come with you competing unattached in college meets. Some people don't even realize you have the US#1 throw at 220-1. Can you talk about how your season has unfolded so far, and especially about that 220-foot throw? How it felt when you released it, what the conditions were like that day, and what you thought when it was measured out? Because I have only competed in two meets for the javelin so far this year, I feel like I still have a lot of potential for throwing a longer mark. I haven’t been able to dedicate myself to javelin completely this season yet, as I am still throwing discus and shot for my high school. But having thrown a new PR in the first of my meets was a great feeling. When I arrived at the field there was a strong headwind, around 25 to 30 mph, which is actually better to have, but not one that strong. The runway was grass, but that was not much of a problem because most of the time that is what we have to throw on. My first throw was the 220’1’’ and when I released it, I knew it was a good throw. I remember when they were pulling the tape, and seeing 219 one foot in front the toe board, I had a rush of excitement and joy. 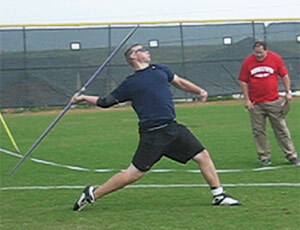 2) If I'm not mistaken, the javelin is not an official event in the state of Texas, right? Is that frustrating, to be among the best in the country in an event in which you can't even compete for your high school on a weekly basis? What steps have you taken to develop yourself as a javelin thrower within those limitations? 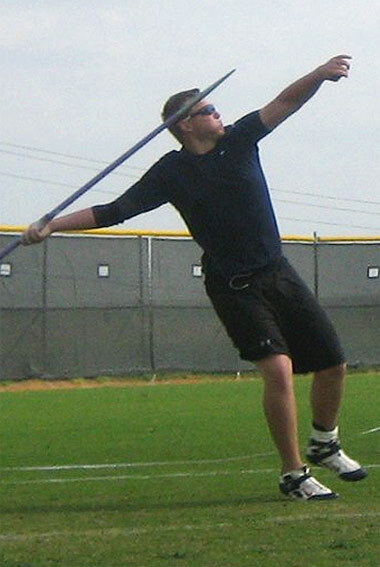 Yes, unfortunately they removed the javelin from high school events a long time ago in Texas, and it is somewhat frustrating that I don’t have the all-year training which, I think, would make me a much better technical thrower. But I’m grateful that if I have a question about any little tweak in my technique, I have a great coach in Alex De Luna, who introduced me to the javelin and is always there to help. Also, I can call my sister who is getting some of the best coaching in the nation at Texas A&M, for additional advice. Plus, after the seven years I have been throwing javelin, I have developed somewhat of a sense of what I did wrong and I how I can correct it. 3) I know you were a USATF Junior Olympic national champion last summer. Was that your biggest javelin win so far, and if not, what would you consider your biggest victory? Was there a particular reason you didn't throw at Nike Outdoor Nationals or USATF Junior Nationals last year, and are either (or both) of those meets in your competition plans for 2009? I think my biggest victory was to come back after a serious injury last year, and then have one of the best seasons of my life by winning the USATF Junior Olympics. About two months before the USATF Jr. Nationals, I broke my right foot practicing. I had to have surgery to put a 6cm screw in my foot to hold the bone together. I got released to ‘start’ practicing just 1 week before the first J.O. qualifier. So, coming back from this injury to win was a definite high. For this season, I’m going to try to get to the Nike Outdoor Nationals, but my focus is definitely getting ready to go to the USATF Junior Nationals and trying to make the U.S. team. 4) It seems like javelin throwing runs in your family. I know you have an older sister who had great success at the high school level and now throws in college, but does the family connection run deeper than that? How did you initially get your start in javelin, and where has the support come from along the way? My sister and I are the first in the family to throw the javelin, and up until around 2002 we had no idea what the javelin was. I got into track by going along with a group of my elementary school friends to join a summer track club in Laredo called Club Olympia, because my mother and father both thought it was a good idea for me to join to keep me busy during the summer. My coach, Alex De Luna, started me throwing the discus and shot initially, since I was too young to throw the javelin. During the discus practice I would spend more time watching the javelin throwers than the discus. Our club has always had success in javelin, so I could not wait to start that event. Support comes from everywhere; family, friends, and sometimes even spectators that I haven’t met before, and I thank everyone that has given or shown support. It's great that in track, you sometimes develop mutual support even among your fellow competitors and you help and drive each other to excel. 5) Throwing the javelin seems to require a unique combination of speed, quickness and strength, translating the horizontal momentum of the approach to the somewhat vertical velocity of the release. Can you break down the finer points of a successful javelin throw, for those who might not know what's going on? I imagine the joints of the arm absorb a great deal of torque through the release; as a thrower, what steps do you take to protect the health and strength of your throwing arm? Some of the finer points of throwing the javelin would mainly be the crossovers, the penultimate step, the plant and leaving the arm back as long as possible to get almost a sling motion, not a throw. The crossovers have to be fast to keep the speed of your run, so that you can plant as hard as possible. Leaving the arm as far back throughout the throw will torque the tendon and muscles in the arm to sling that javelin at a higher speed than if you were to throw it with just your arm. Having extreme flexibility in the arms and legs along with the strength in your core muscles is the key in being very successful in the javelin. 6) I know a lot of top javelin throwers come to the sport from other athletic pursuits...pitching for the baseball team, quarterbacking the football team. Are you involved in any other sports throughout the year, and if so, how does that fit into your track and field training? Have you had to leave any other athletic pursuits behind as you realized how good you could be as a track athlete? I was a baseball player up until my 7th grade year. I played different positions that required me to throw a longer distance like 3rd base and outfield, and I also pitched. I quit baseball to start throwing in track. My junior year of high school, I quit football and basketball to focus on my track training. It was tough for me to give up football to pursue a career in track and field, but the dream of me making it to the World Championships or Olympic Games just dominates any desire I had making it big in any other sport. 7) I know you've signed with Texas A&M for college next year. 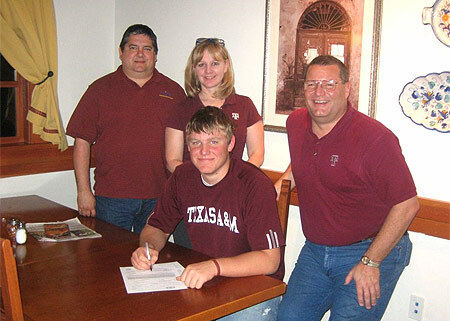 How was the recruiting process for you, overall, and what was it about Texas A&M that convinced you that was the place to spend the next four years? When it comes to being an Aggie next year, what things are you looking forward to? The recruiting process was awesome. Some of the coaches that came to my house were the coaches from Oklahoma and Texas A&M, and I was in contact with the coach from North Carolina. After my sister spent a year at Texas A&M and told me about her experience there, that was the dealmaker for me. I wanted everything that she was experiencing, and I already knew the coach and knew that he could make me better. What I’m looking forward to is mainly the jump in my technique and the meets I will go to.